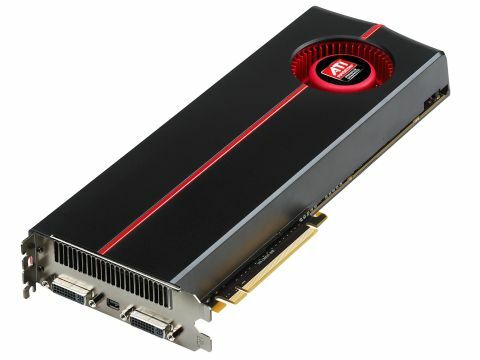 The fastest graphics card in the world - but is it worth £600? Fast. Really fast, especially when given a bit of judicious tweaking, but way too pricey. And here it is, the ATI Radeon HD 5970, the fastest graphics card in the world. All hail its mighty rendering pathways and the gods of silicon for bringing us this technological wonder. It's faster than any graphics card we've ever tested, it's bigger than any graphics card we've ever tested and it houses more technology than you could shake Stephen Hawking at. So why then are we feeling so utterly underwhelmed? We had pricing issues with the original ATI Radeon HD 5870; its £320 price point making a mockery of AMD's previous successes with more svelte, cheaper cards than the monolithic strategy of its Nvidia rivals. In today's market such expensive cards are less viable purchases and more tech demos. We're not just talking about the financial climate either, in this gaming world where most titles are developed for three year-old console technology you hardly need the sort of power such cards are touting, unless you've got a couple of 30-inch panels strapped together. The same obviously rings true for a card that's sitting dangerously close to £600; it feels even less like a viable consumer card and more the sort of thing to ensure competition once Nvidia's DX11 Fermi cards hit our test benches in a month or so. We're also slightly dubious as to how many of these cards you'll actually see in the wild. Reference and manufacturer boards have been made available to us, but we still find it difficult to track down any 5800-series cards in the country. Most retailers are out of stock - the supply just isn't there. AMD assured us that the 5970 launch is coinciding with a ramping up of its 40nm production which should mean thousands of chips being produced every day. Whether it will produce enough to cover demand for both 58xx series cards and the 5970 we'll have to wait and see. But that's all by the by if the beast performs like the beast we're told it is.